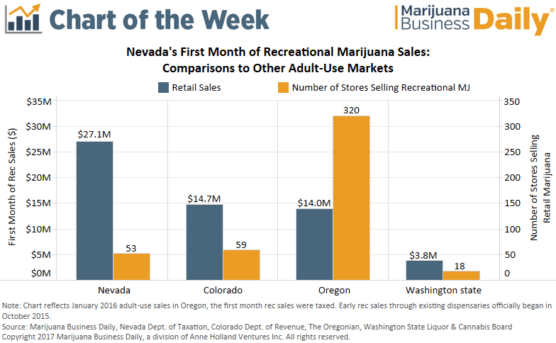 Nevada’s recreational marijuana industry is off to a blistering start, with early sales far surpassing the totals other adult-use markets posted their first few weeks. The development highlights how different approaches to the rollout of recreational marijuana – as well as unique market dynamics – can greatly influence early sales. Dispensaries in Nevada sold a whopping $27 million worth of recreational cannabis during the first month of sales in July. That’s nearly double the tally during the first month of sales in Colorado and more than seven times the amount Washington state recorded. The figure also is almost double the $14 million Oregon posted in the first month of taxed rec sales (no data is available for the three-month period of sales before the tax took effect). Nevada opted for an “early start” program that allows licensed medical marijuana dispensaries to begin selling adult-use cannabis while the state still works through the recreational licensing process. Oregon followed a similar path, while Colorado and Washington state mandated that businesses obtain full recreational licenses first – meaning only a limited number of stores were actually open in each market the first few weeks of sales. It’s clear that the early start program allows a market to get a big jump out of the gate. Many dispensaries in Nevada opened their doors to adult-use customers at 12:01 am on July 1, and business has been booming ever since. Chalk it up not only to the early start program but also the thriving tourism industry in Las Vegas, which is home to 36 of the 53 dispensaries throughout the state that are licensed to sell adult-use cannabis. Larry Doyle, owner of Euphoria Wellness in Las Vegas, believes Nevada was generally well prepared to accommodate the influx of out-of-state customers – particularly when compared to the rollouts of rec programs in other adult-use markets. “It certainly was well marketed nationally, so people coming here were aware that rec had begun in Nevada and that most people could walk into a dispensary,” Doyle said. Nevada kept purchase limitations between out-of-state customers and Nevada residents the same – 1 ounce of flower at one time from a recreational dispensary – eliminating some of the confusion surrounding the launch of a new rec program. At the start of rec sales in Colorado in January 2014, residents were allowed to purchase up to an ounce of marijuana per day, while visitors and tourists were limited to just a quarter ounce per day. Similar to Nevada’s early start program, Oregon allowed MMJ dispensaries – in October 2015 – to start selling recreational cannabis before implementing its full adult-use licensing program. The state started releasing sales data in January 2016 when taxes on rec cannabis transactions kicked in. It’s possible that Oregon’s true first month of sales, which were not taxed, surpassed the total in Nevada. The Oregon Retailers of Cannabis Association previously estimated that rec revenues hit $11 million in the first six days of sales in October 2015, which would’ve put the state on pace for more than $50 million for the month. Retail sales got off to a slow start in Washington state, as only a handful of stores were able to open at first. The state also grappled with supply issues and other challenges that limited growth. While tourism has been providing Nevada’s cannabis industry with a big boost, strong sales among the local customer base signal a promising future for Nevada’s rec industry.